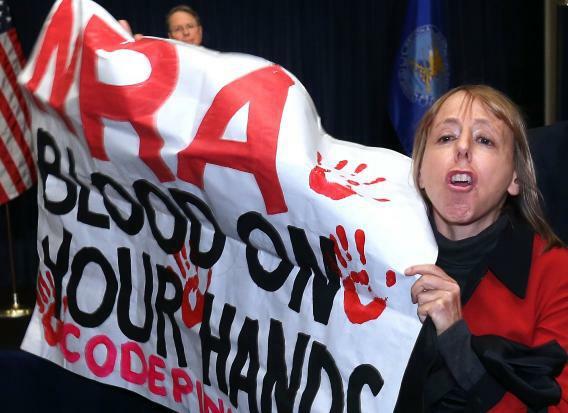 Medea Benjamin of CodePink is removed by a secretary personnel as she protests during NRA CEO and Executive Vice President Wayne LaPierre’s news conference at the Willard Hotel December 21, 2012 in Washington, DC. Today’s congressionally designated dog-and-pony show is happening in the Senate, where NRA bulldog Wayne LaPierre and Gabby Giffords’ husband, Mark Kelly, will testify on gun control. LaPierre, who has an impressive, Aleksey Vayner-esque faith in his own power to persuade, has already released his prepared testimony, and Joe Weisenthal kicks it around. I’m a day late to this David Brooks column, which is strange, because the idea of ripping off concepts from Canada and Germany is compelling. It’s smarter to build a new wing of the Republican Party, one that can compete in the Northeast, the mid-Atlantic states, in the upper Midwest and along the West Coast. It’s smarter to build a new division that is different the way the Westin is different than the Sheraton. President Obama’s personal favorable rating — not his job approval, just how much people like him — bounces to 60 percent in the WaPo/ABC poll. Benjy Sarlin notices that Democrats are trying to pass immigration reform without accidentally cutting campaign ads for Rubio 2016. Anna Clark dissects the cruddier gun control coverage out there. Per the above-mentioned Plain Dealer piece, the Ohio gun store owner “disagrees with the sentiment that teachers should be given weapons”—which, in context, implied this is part of Obama’s proposal, when of course it is not. The National Rifle Association, which initiated that “sentiment,” was not mentioned in the piece. I’m taking part of the day off, but there’ll be the occasional item here. Correction, Jan. 30, 2013: This story originally misspelled Aleksey Vayner’s first name.